In contrast to the heavily political 1960s, 1970 arrives, toning things down a notch. People are bettering themselves and shifting their focus to individual satisfaction. A quote by President Kennedy, “Ask not what your country can do for you, but what you can do for your country,” defined the previous decade. But things are changing. The 1970s are all about expressing yourself. 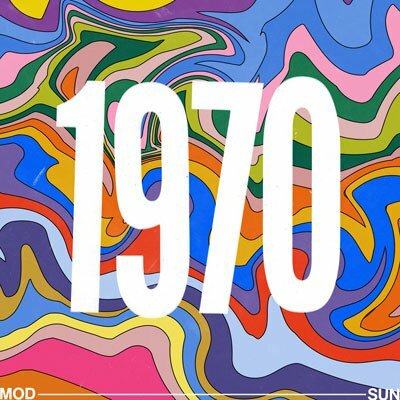 1970 sees one of the most epic line – ups in music festival history. The Isle of Wight festival takes place from 26 – 31 August, and is the last to take place on the island due to objections from the residents who were less than impressed with the influx of hippies and “freaks” descending on this retirement destination. Headliners included Jimi Hendrix, Black Widow, Redbone, The Doors, The Who, Leonard Cohen and Kris Kristofferson. It was the ideal festival for those strapped for cash, as it’s venue was overlooked by a large hill that people stood on to watch the acts for free – you wouldn’t see it happening in this day and age, that’s for sure. The Beatles release their final album Let It Be in May. The month before, their break-up was publicly announced by Paul McCartney, following his decision to leave the band. Simon and Garfunkel are another act who release their final album together in 1970. Bridge Over Troubled Water, the album’s title track scooped up the Grammy title for Song of the Year also. David Bowie releases the revolutionary album The Man Who Sold The World, making reference to his schizophrenia, paranoia and delusions. It was a step away from his acoustic, soft style in Space Oddity, released the year before, and a step toward more heavy rock. Bowie becomes now, more than ever, a force to be reckoned with. His androgynous style and shifting genre add more fuel to the fire, leading Bowie to become one of the most influential musicians of the 20th century. Two historic events take place on the streets of NYC. The first New York marathon and the first gay rights march take place months apart. This monumental moment for the LGBT community has since become a tradition celebrated annually, and is now known as the Pride Parade. 1970 also brings the untimely deaths of two iconic stars due to drug overdose – Jimi Hendrix and Janis Joplin. It also, however, is the year that sees the survival of astronauts James Lovell, John Swigert and Fred Haise, occupants of the Apollo 13 spacecraft, against all odds. We’re talking about the mission to the moon that made the statement “Houston, we’ve had a problem” famous. Despite exploding oxygen tanks, loss of water and electricity, and having to reconfigure their course to earth, the crew crash – landed in the Pacific Ocean safely and soundly. 1970’s bestselling books include Erich Segal’s romance novel Love Story which sat on The New York Times’ bestselling list for 41 consecutive weeks and Ernest Hemingway’s Islands in the Stream, published posthumously. People are also reading Mario Puzo’s The Godfather. Though published the year before, this masterpiece is here to stay, later to be adapted to a film franchise. Kids play with Barbie dolls and Hot Wheels and the US and UK governments lowered the voting age from the age of 21 to 18. What an epic year to kick – off an epic decade.